The grip is a vital component to the golf swing. If you put your hands on in the wrong place, then your body will be constantly striving to adjust for a misaligned clubface. The major key requirement of a good grip is to allow freedom of movement of the wrist. I frequently see golfers who have the grip in the palm which locks the wrist joint and causes excess eblow and shoulder movement. You have probably heard the term Strong, Weak, or Neutral grip. There are lots of reasons that these words have stuck around as descriptions, but here is one way to understand the implication of the strength of the grip. When you approach impact, the arms are going to fling away from your body toward neutral alignment, which is going to be with the left wrist flat and in lign with the left arm. If you remember from the ball flight section, a closed clubface will tend to be more delofted and an open clubface will tend to add loft. So a STRONG grip, closes the clubface to the path and delofts the club through impact. This causes the ball to want to start more left and lower. A WEAK grip tends to open the clubface and add loft, which tends to cause the ball to start more right and higher. A NEUTRAL grip is somewhere in the middle of weak and strong. It is typically referred to as seeing 2.5 knuckles, but this can create a very small/subjective scale. For me, the easiest way to monitor your drip strength is to place the left arm vertical and the wrist in a fixed position and see what the club looks like. For a “neutral grip” you will see the club turned about 20-30 degrees. A weak grip is close to vertical and a strong grip is close to 45 degrees. This is a good place to start for beginners, but if you have an established swing, then it’s best to not mess with the grip strength at this point. Can't I Just Strengthen My Grip? What are the pros/cons of avoiding "the motorcycle" and opting for a stronger grip? Training Your Full Swing Grip At Home Frequent reps will train your grip faster, but you don't always need a club to do it. Insight - "Natural" Grip Strength? Can you really use your arm hang to find your proper grip strength? 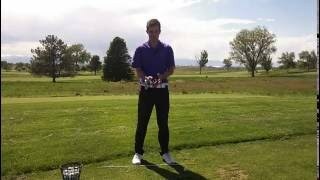 "Grip Strength" Learn how to classify how you put your hands on the club. Set Up Circuit Here is a simple drill circuit for working on building a solid set up. The Putting Grip (myview) A first person view of one way to make sure that you have the putter in the right place in your hands to allow a big muscle stroke.